Bottom Line: a cutting edge design with great specs for the price. A bit dark and industrial looking. Definitely a very strong competitor in the value-tier. Emotiva is a small and more recently formed American audio company that caught our attention when various publications and usergroups started to tout their budget-tier speakers, in particular the the Airmotive B1 reviewed herein. The standout feature of these speakers is the folded ribbon tweeter, which is a new and still relatively uncommon design choice with budget-tier bookshelf speakers. The larger surface area, in comparison at least to a more common 1 inch dome tweeter, allows for a more accurate and even response curve that also has a higher range. While most dome tweeter top out at around 20k Hz, the Airmotive B1 tops out at 28k Hz. Now you might be thinking: what’s the point of that if the human ear can only hear up to ~20k Hz? Well, in addition to the response curve staying nice and flat up to that point, it also means the tweeter has a lower floor, which means the woofer has more room to really focus on the midrange and dip lower. 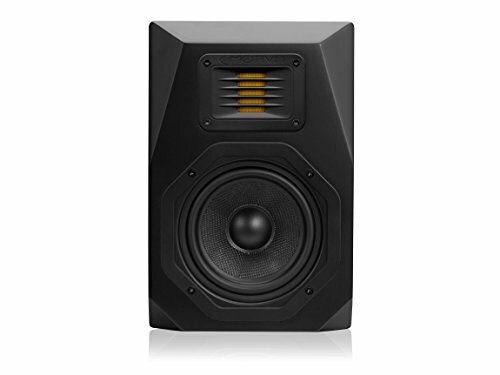 While Emotiva isn’t reluctant to say this is a 2 channel or surround speaker that’s best paired with a subwoofer (a usual standard with bookshelf speakers), the quoted response range within a 3 dB differential is actually excellent for a two way bookshelf speaker. It’s definitely possible these would suffice as standalone satellites, which we wouldn’t say for a lot of other two way bookshelf speakers. But, two-way bookshelf speakers will always have limited bass – a single midwoofer can only do so much. The main driver is a woven fiber/cloth blend which, if made well, has the propensity to sound really great at near/mid range. The downside of paper/cloth drivers is that they’re more delicate and prone to damage or general wear and tear. Emotiva offers a 5 year warranty on the Airmotive speaker lineup though, which is top of the line coverage for budget speakers. 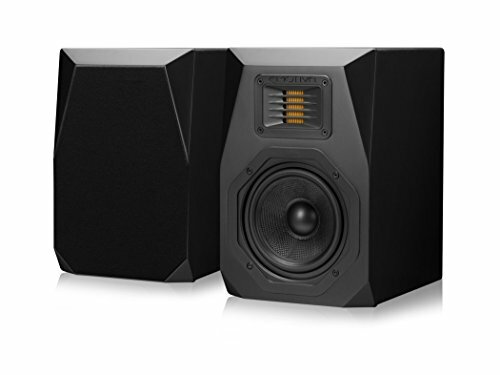 The power specs are quite good too – a 70/150 W rms/peak speaker will get plenty loud, though these might not suffice as the base of a full sized home theater system. Emotiva has a few towers in the same lineup (reviews forthcoming) which we assume are intended to for that specific purpose. The cabinet is a fairly boilerplate black MDF with rounded edges, while the baffle is an interesting geometric shape that slightly embeds the woofer and puts the tweeter in a small horn. These are definitely forward speakers, meaning you’ll want to aim them at a sweet spot where the user would presumably sit. The square and octagonal basket is kind of industrial looking, not the slickest thing ever, but a minor aesthetic criticism. Or you can choose to cover them with the included cloth grills which are magnetically attachable. Size wise they remain relatively compact and light for a 5.25 inch ported speaker, but they will need room in the back for the port to breathe. This is the only budget tier bookshelf speaker with a newer ribbon tweeter and cloth cone that we’ve reviewed thus far. The specs are excellent for the price and this kind of design has a propensity to sound really great at closer range. Cheaper alternatives with comparable specs do exist, but the Airmotiv B1 appears to be a really great overall value and strong competitor in its price-tier.